Senator Jeff Stone addresses members at a Legislative Breakfast. 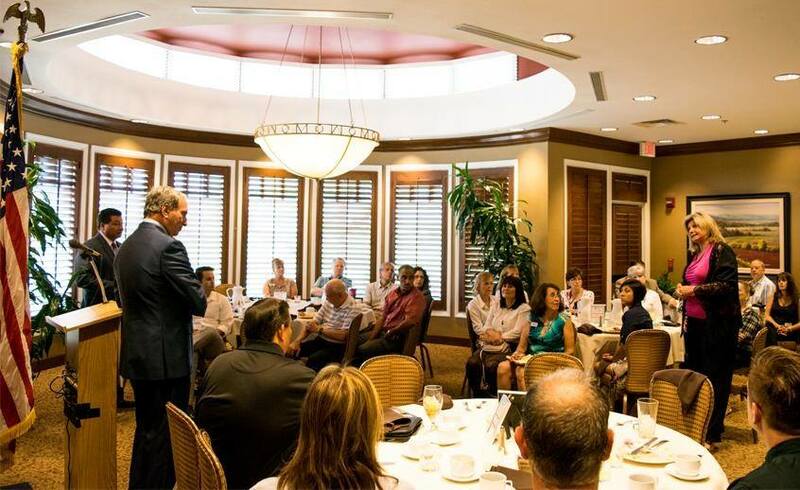 The Greater Coachella Valley Chamber of Commerce offers a variety of opportunities and avenues for local business owners and professionals to stay up to date on the latest trends and changes in business. No matter your industry the business world moves fast, our education and training programs are timely, convenient and presented by leaders from a wide range of business segments. Local elected leaders from all levels of government regularly join the Indio Chamber for morning legislative updates. Speakers will share their views on pending legislation, proposed changes and their vision for our economy and community. Members have the opportunity to engage them on the issues that are important to them and share conversation in a relaxed setting. The Chamber brings the best and most respective business leaders from across the region to you in its Tips and Tricks series. Through our partnerships we are able to present timely and cutting edge information from the world of marketing, human resources, finance, digital and much more. Stay up to date, stay competitive, and stay in tune! The Chamber will also host national speakers when the information is relevant to our local businesses. In 2015 we hosted a special presentation by Facebook. In 2015 we partnered with Google to be sure our businesses were on the digital map. We pride ourselves on having unlimited reach when it comes to bringing the best resources to our members.